A Beachlands house, the first Passive House Plus in New Zealand to be awarded a 10 Homestar built rating, has been put on the market for sale. 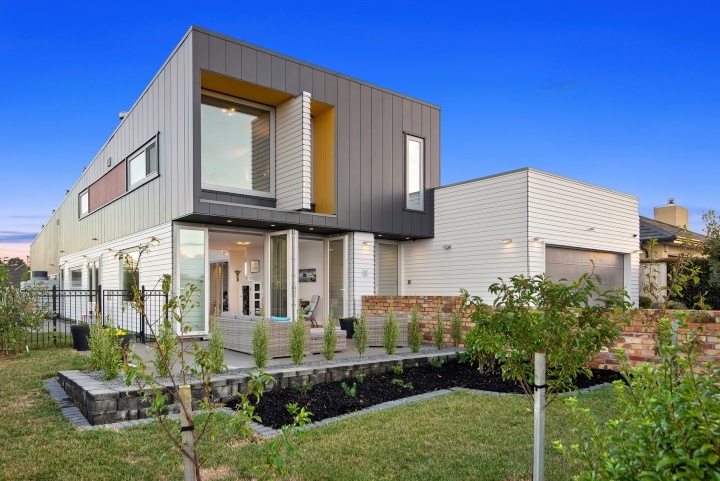 Built in 2014, the four-bedroom/three living room modern house at 23 Reliance Crescent was designed to be one of the most energy-efficient in New Zealand. The two-storey, 270 square metre home on a level 860 square metre section is being marketed for sale at auction on April 9 by Bayleys Manukau salespeople Clare Nicholson and Clare Dower. Dubbed the Ideal House, after its key supporter, Ideal Electrical, it maintains warm, healthy temperatures year-round without the need for extra heating. Using 80 percent less energy than a standard home, the 32 photovoltaic panels on the roof means the home produces about 35 percent more electricity than what is consumed during the normal operation of the house. A balanced heat recovery ventilation system and other technologies ensure the house has low humidity and CO2 levels. Low energy consumption lies at the heart of the Passive House standard, and adherence to this is achieved through incorporating extremely high levels of insulation, high performing windows, an airtight building envelope, mechanical heat recovery ventilation and careful design, which minimises thermal bridging. Other key features of the home include: over slab floating floor system, double-layer walls, low-e triple glazed PVC windows, high levels of insulation and airtightness, heat recovery balanced ventilation, rainwater harvesting with double filtration and UV treatment, and an electric car charger. Situated on Auckland’s Pohutukawa Coast in Spinnaker Bay, the home has been thoughtfully designed with separate living and entertaining areas, and sea views from the second storey, including the roof terrace and master suite. With al-fresco dining in the courtyard, a reclaimed brick wall in the fully landscaped garden, and extensive plantings, the home is nicely established in the grounds. Extensive food-producing plants have been established around the property, including an “urban orchard” and vegetables gardens, Ms Dower said. Fruit trees and vines include fig, plums, tangelo, apple, orange, lime, lemons, feijoas, grapefruit, persimmon and mulberry. The owners have enjoyed living in the home, saying it is the best, most healthy, warm, comfortable home they have ever lived in. It has maintained a constant 20-23 degree temperature with little to no additional heating required, by recycling what is already produced in the home from the occupants and appliances. Even the steam from a hot shower will be recycled and warm the rest of the home. Inspired by their involvement in the first Passive House in New Zealand, and after years of living in cold and damp homes, the owners built the home to provide a better living environment for their family, and as an education tool for others. The Passive Home movement began in the 1980s and tens of thousands of these homes have been built worldwide. The standard is now even being applied to schools and hospitals. Passive House is an accreditation that requires strict design build processes and auditing. There are only a handful of certified passive houses in New Zealand but there is a strong movement to support this kind of building. Incorporating Homestar into the Beachlands build was a natural progression for the owners. That allowed them to incorporate other environmental considerations such as rainwater harvesting, native planting, low maintenance and environmentally friendly materials, waste management, and site permeability reducing stormwater run-off. The process of building and living in the home has made the owners passionate about the benefits of high-performance houses. To help showcase the benefits, they opened the house regularly as an educational show home to inspire others to build healthier, more energy-efficient homes. BRANZ research shows the building code is universally mistakenly used as the target quality standard rather than a legal minimum. Code minimum does not present satisfactory levels of comfort, health and well-being, nor efficiency in regulating heat and energy consumption. The initial concept for the home was the brainchild of Auckland University architecture lecturer Paola Leardini, with architectural design and detailing completed by S3 Architects. Built as a ‘forever-home’, Ms Nicholson said a change in the owners’ circumstances provides the opportunity to experience a home that raises energy-efficient standards.